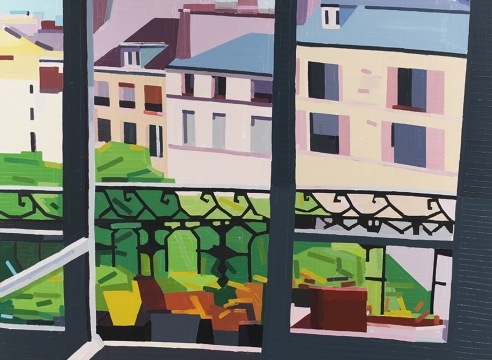 NEW YORK, NEW YORK – AMERINGER | McENERY | YOHE is pleased to announce Ancienne Rive, an exhibition of new paintings by Guy Yanai. 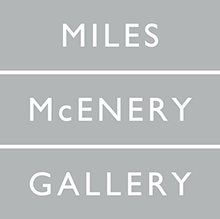 The exhibition will open on 9 July 2015 and will remain on view through 14 August 2015. A public reception for the artist will be held on 9 July from 6:00 to 8:00 p.m.
and the notion of being both nowhere and everywhere. The commonplace subjects depicted in the artist’s work directly reflect his idea of being rootless. Classical themes of landscape and still life are re-imagined in this new body of work and allow Yanai’s vision to be both relatable and discernible to the viewer. Everyday subjects suggest that he is disenchanted by the throwaway nature of modern day society. Yet, there is a beauty in the simplicity and naiveté to his paintings. Tension exists between every stripe as one coat of paint is used, leaving small areas of raw canvas. Each stripe is critical to the work’s success. The seemingly mechanical nature of Yanai’s paintings is misleading as the more time spent with the work, the more there is to discover. The exhibition is accompanied by a catalogue, also titled Ancienne Rive, with texts by Cary S. Levine and Timothee Chaillou, designed by Aurore Chauve and published by Yanai and Chauve’s publishing house, Yundler Brondino Verlag. GUY YANAI was born in 1977 in Haifa, Israel. He attended Parsons The New School for Design, New York, NY and the New York Studio School, New York, NY, and received a BFA from Hampshire College, Amherst, MA. Yanai has had recent solo exhibitions, including “Diary,” Galerie Derouillon, Paris, France; “First Battle Lived Accident,” Alon Segev Gallery, Tel Aviv, Israel; “Accident Nothing,” Aran Cravey Gallery, Los Angeles, CA; “Lived & Laughed & Loved & Left,” La Montagne Gallery, Boston, MA; and “Battle Therapy Living Room,” Velan Center for Contemporary Art, Turin, Italy. Recent group exhibitions include “Par Ici Mon Kiki,” Le Coeur, Paris, France; “Summer Mixer,” Joshua Liner Gallery, New York, NY; “Just Before Brazil,” A.L.I.C.E. Gallery, Brussels, Belgium; “EDEN/EDEN,” Galerie Torri, Paris, France; “GROWTH,” Charlotte Fogh Gallery, Aarhus, Denmark; and “Senses of the Mediterranean,” Hangar Bicocca, Milan, Italy. Yanai currently lives and works in Tel Aviv, Israel.